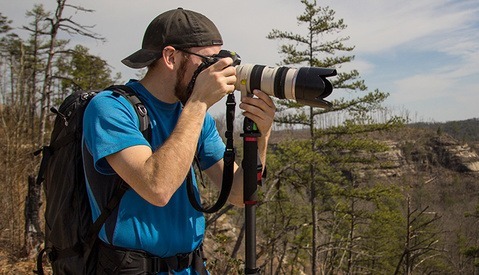 Monopods, once really only useful in a handful of situations, have evolved into irreplaceable members of our creative arsenals due to the advent of high quality video being produced in DSLRs. The idea of a “video monopod” might frighten video purists, but there are those such as Patrick Hall and myself who swear by them. Manfrotto’s version was a fantastic foray into the medium, but slightly pricey. Benro recently released their more affordable versions, and I was more than ready to see if they were able to hold their own. 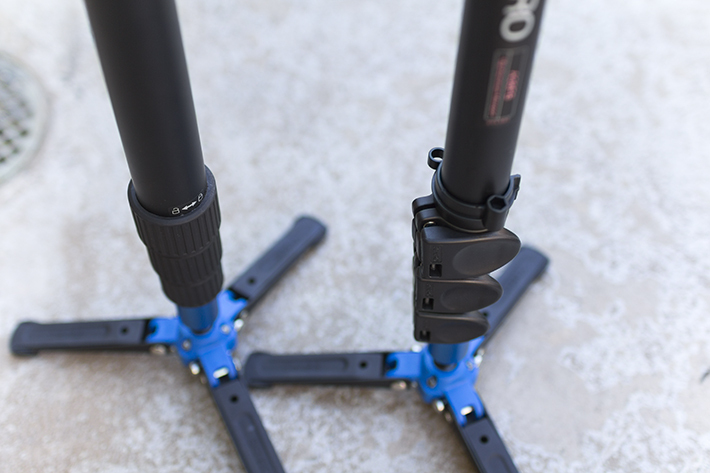 Benro offers their version of a video monopod with a couple options: You can get them in two different sizes with two different styles of leg locks (clip locks or twist locks). Though it probably wasn’t wholly necessary to give us the ability to choose these kinds of options, I do appreciate the personal customization slant. I myself like twist locks in many situations, but Mike Kelley actually hates them and would much rather have clip locks. Whatever you prefer, you can get on your Benro monopod. Benro sent me two sizes to review: the S2 and the S4. The S4 is more what you are probably expecting and what I classify as “standard” size. The S2 is what I would call “mini,” though it is only a little shorter than the S4 (65.5” inches max, 25.8 inches compacted). That doesn’t seem like that much of a reduction in size from the S4, but side-by-side you can certainly tell one is considerably smaller (not necessarily in height, but in overall girth). Mainly, the pan head has been significantly reduced in size. The S2 has some issues, and I think they are mainly due to the miniscule stature of the monopod. Though the pan head works just fine as far as panning and tilting goes, the size of the plate is difficult to use with a DSLR. Though the new tiny Canon Rebel SL1 might be the only exception, the tightening lever that holds the plate in place on the head is located in a very awkward position (honestly both the Manfrotto and Benro S4 have the same issue, but the size of the plate on them makes it far more manageable). It can be a real pain to lock and unlock the plate, especially if you have large hands or fingers. My hands are tiny and I still struggled. A contributing factor is also that the tightening joint on the S2 is on the left side of the pan head, while it is on the right side on the S4. Though this was kind of irritating, it wasn’t where my real issues with the S2 were based. While using the S2, the ball that connects the bottom of the monopod shaft to the foot was extremely sticky. 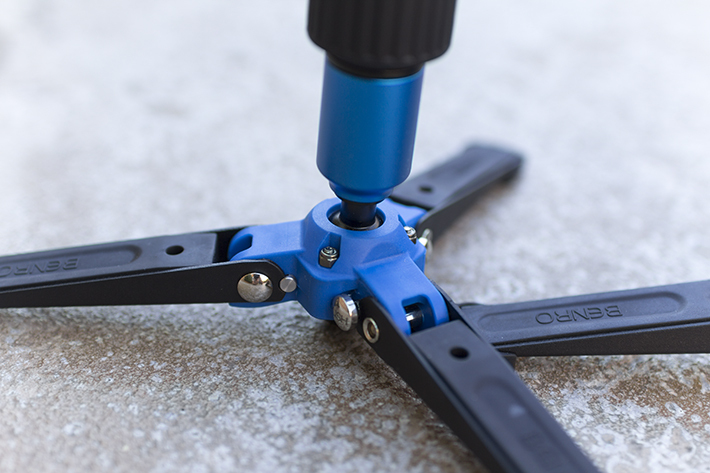 The benefit of the video monopod is the ability to smoothly tilt forward and back on that ball joint. With the S2, it just wasn’t working at all. In fact, in many cases the foot actually lifted off the ground in my attempts to tilt. Like I mentioned, I believe this is caused by the small size. The monopod might just be too small for its own good, lacking the weight to actually compress down on the foot and therefore move smoothly. It’s either this or I have a faulty unit. 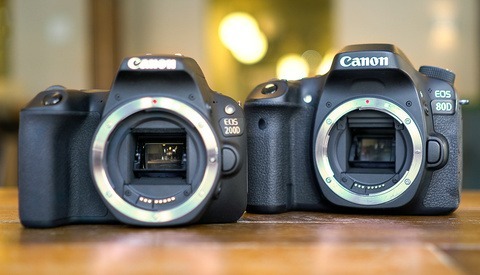 In general, ignoring my specific issues with it, the size of the S2 might work for smaller cameras but for DSLRs and pro-level camcorders it’s just a bit too small. The handle for panning is dinky and feels fragile even though it's basically the same size as the S4. The size of the pan head itself makes everything feel small. You might find yourself gently cradling the handle like you would a champagne glass neck, and that’s just weird. If you’re looking to go really small and keep your video project fitting inside of a backpack, this might be a good option. Otherwise, I can’t say I was a fan of the size. The S4 is a totally different story. Though a few inches shorter than the Manfrotto version when fully compacted, it works just about as well as the market leader. It’s made of aluminum and plastic parts and feels sturdy and reliable. The pan head works exactly like you would expect and is sized well for DSLRs and camcorders unlike its smaller brother the S2. The plate-tightening knob that I found irritatingly placed in the S2 is still easily blocked by the shape of a DSLR body, but it’s nothing you won’t be able to get past (like I said, the Manfrotto has the same issue). The problem I had with the foot on the S2 is nonexistent in the S4. The pan head is also bigger and feels sturdier, culminating in a product that just feels more complete. Though it is shorter than the Manfrotto and seems to include more plastic parts, oddly the weight difference between the two is negligible, if there even is any. That is not to say that the S4 is heavy, actually I would argue it’s extremely light at only 3.7 pounds (that includes the heavy pan head). I was just expecting it to weigh less with fewer metal parts in the build. My tester unit of the S4 was the twist lock one, and I really liked this build. I found it easier to extend and compact the monopod as I moved around than with a standard clip lock. The piston-like monopod leg has three stages, all of which were smooth and easy to operate. Looping back around to the size for a moment, the squat stature (folded length of 27.6 inches) of the fully compact S4 makes it fit into the included carrying bag, which is hugely useful for travel. I was very grateful for it while moving around Los Angeles. It’s size does not take away from the fully extended length of the monopod, however, which at its max is far more telescoped than 95% of the intended users will ever find issue with. I have difficulty imagining a situation where I would use the monopod at its maximum extension of 73.2 inches. 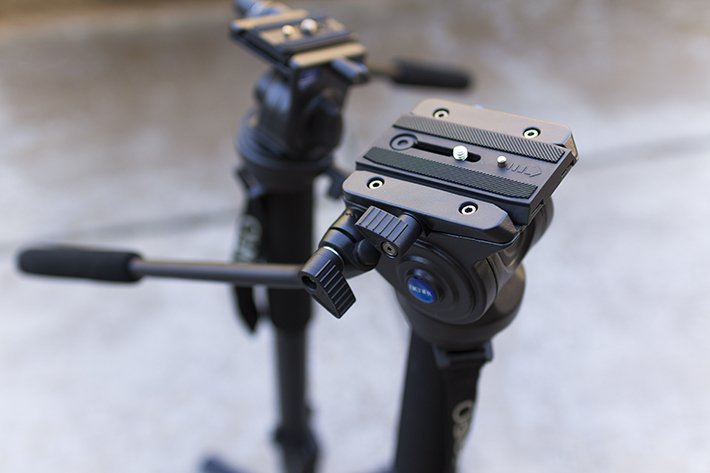 I think the most loveable part of the Benro S4 monpod is the price: $200. That’s a raging deal for what you get with a video monopod. It’s $100 less expensive than the regularly priced market leader by Manfrotto, and you aren’t sacrificing much. It’s true, there are parts that are obviously lower quality than the market leader’s, but that isn’t to say that they are low quality. They’re good, just not over and above expectations. If you’re looking to save money, the Benro S4 is a solid buy. Going back to my issue with the tightening knob, the placement of that knob is more of an issue born of a design that was left unchanged from the pan heads that were used for years on rectangular long camcorders instead of the wider-bodied DSLRs. What we get these days is a Frankenstein-esque amalgamation of parts mushed together to create a great, but still imperfect product. No one has yet addressed this issue as it is not a glaring one, but Benro makes no strides at innovation here. This is somewhat disappointing given the proven success of the market leader. If more time was spent in advancing on a good design instead of just making another very similar version of it, we might have ended up with a revolutionary product instead of just a lower priced (yet still functional and well-built) one. 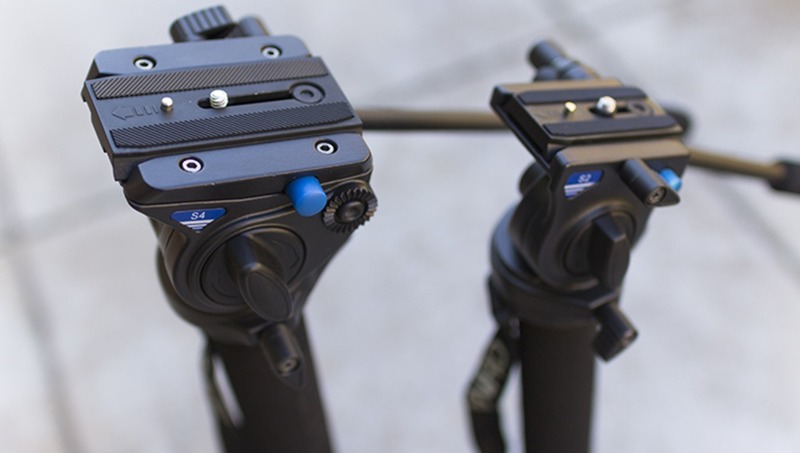 Benro went straight for the throat of the market leader with their S2 and S4 monopods and were largely successful in reproducing the popular video camera stabilization option for a lower price and more customizable options. Looking past my issues with the smaller S2, the S4 is a solid monopod that is lightweight, inexpensive and highly useful for the DSLR videographer. For more information, head over the product page for the S4 at B&H. 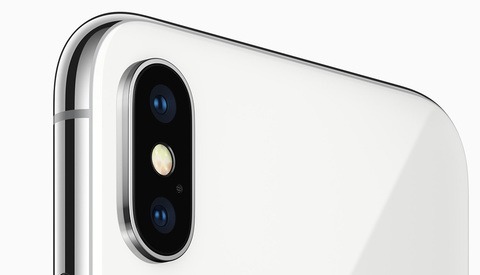 Why Can't My DSLR Shoot 4K 60p, but the iPhone Can? 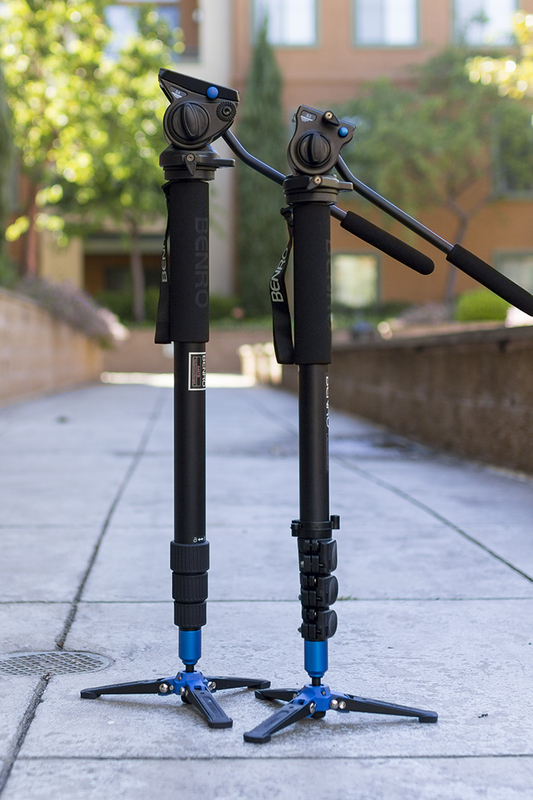 Fstoppers Review of the 3Pod Monopod for Field Photography, Video, and Self Defense? The plate looks to be about the same size as the Manfrotto 501 plate, would a Manfrotto plate work? Yes, the plates are compatible both ways. Mafrotto 501 plates work on the Benro S4 and the Benro S4 plates work on the Mafrotto. I actually went to go test this and came back to verify, but you beat me to it Brian! Yes, it totally works. Benro did an amazing job copying the Manfrotto design and then changing (simplifying) it just a little bit. Where's the real innovation? Played around with this at NAB this year. It's a quality piece. Digging the colors too. I owned the newer ( red panning cartridge ) Manfrotto 561BHDV-1 monpod for about 1 year and ran into problems where the monopod itself would "squeak" when moving ( sound guy would curse when we had to reshoot because the dang monopod kept making noise ) and the foot would occasionally bind causing bumpy pans. The new red panning cartridge was supposed to fix this binding problem, so I was pretty pissed when I found that nothing had changed from the previous "black" cartridge. So last month I sold my Manfroto monopod ( good riddance ) and bought the Benro S4 with the twist-lock collars, and it has been amazing so far. All of the problems I was having with the Manfrotto are now gone. The panning on the Manfroto was smoother when it worked properly, but the dang thing wasn't 100 percent reliable which is more important to me. Highly recommend the Benro S4, which comes with a very well made padded carrying bag. I'm wondering of i can mod my manfrotto 682 a bit to be used like this. Just noticed the Benro monopod, and as a persone about to purchase the Manfroto version, I was so glad you posted this review. Covers pretty much everything I was curious about. Perfect timing, and well written. Glad to find this review on Benro. I was seriously thinking of getting the Manfrotto monopod tho! hi i have a quick question. i have a benro s4 video head and a monopod a28t from benro. the s4 is bigger so it cant fit to the monopod. is there any way for them to fit? like what accessory should i buy? thanks! Looks like Benro refreshed this model using FD instead of FB as the moniker. (A48FDS4 for example). From what I've seen, it looks like they got rid of the panning cartridge at the bottom which makes it a dealbreaker for me. I think I'll stick to the Manfrotto ones now. Not sure why they made that decision, but I guess it's to cut costs. Sigh.